Set the controls for the heart of the sun with our interstellar 32-page celebration of the original space-rock band. Pink Floyd’s First Gig Long before giant arenas and flying pigs there were village halls and Chuck Berry covers. The Producer Speaks Original knob-twiddler Norman Smith on their early years. The Progressive Years Release the cows! Floyd ramp up the experimentalism. Dark Side Of The Moon How their biggest album started with an on-stage bust-up. Wish You Were Here Flaming stuntmen, a surprise appearance from an old friend… and the beginning of the end for the band. Caught On Camera Legendary photographer Jill Furmanovsky delves into her archives to bring you her personal selection of Pink Floyd shots. Behind The Wall Dismantling Floyd’s magnum opus, brick by brick. Gilmour Versus Waters How intractable tensions led to a 20-year power struggle – and a pair of giant inflatable testicles. Syd Barrett and Rick Wright remembered A tribute to Floyd’s musical yin and yang. 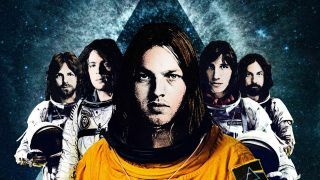 David Gilmour speaks! The guitarist grants Classic Rock a rare audience. On the agenda: his new solo album, ‘psychic holes’ and Floyd’s future. **Europe **The days of heading to Venus are behind them. In 2015, Joey Tempest is bringing The Final Countdown to the Middle East. The Decline Of Western Civilization Part II Inside the infamous Sunset Strip documentary, by the people who made it. Warning: includes hot tubs and strippers. Alabama Shakes The most exciting new singer around? AC/DC-loving rock’n’soul barnstormer Brittany Howard could be it. Spike’s Free House How the Quireboys singer’s new band began as a tribute to Frankier Miller and ended up as a tribute to Andy Fraser. Raw Power McIntosh, the people who powered the 1969 Woodstock festival, make their first entry into the headphones market. The Stories Behind The Songs: 10cc Inspired by a fantasy air hostess, I’m Mandy Fly Me was the song that launched a thousand intra-band arguments. Q&A: Denis Leary The motormouthed comedian-turned-small-screen rock star on why he should be the next singer in Led Zeppelin. **Buyer’s Guide: Bob Seger **Stand aside, Kid Rock, and tell Ted Nugent the news – looking back over the career of Detroit’s original blue-collar hero. Live Previews Must-see gigs from King Crimson, Rich Robinson and FFS. Plus full gig listings – who’s playing where and when. Read Classic Rock magazine the way you want. Instantly read the articles from issue 214 of and dive into the back issues right now on TeamRock+. Experience the interactive digital edition for your iPhone and iPad or Android device. Get a copy of Classic Rock 214 delivered to your door.